At first I wanted to write my own review of this book, where the author describes his story of taking down and burning the Hinomaru during a Softball Competition Opening Ceremony in Okinawa. I was pointed to this book by reading the great In the Realm of a dying Emperor by Norma Field, and luckily could got a copy. But reading in the appendix the author’s own opinion statement sent to court, I was overwhelmed by the strength of his words. There is nothing to add, nothing to explain. His text speaks for itself. The text is taken directly from his book, translated by South Wind. No matter what you may do there is always sufficient cause to make you act in one way or another. It is very unwise to appraise an action without clarifying the cause. Sometimes on action reflects more than a thousand voices. The cause of my action of pulling down the ‘Hinomaru’ and burning it is that I had learned of the tragic experience and misery suffered in Okinawa during World War II, and I am concerned with the current leanings towards war. In order to accomplish the aim of the preceeding paragraph, land, sea and air forces, as well as other war potential, will never be maintained. The right of beligerency of the state will not be recognized. There is no greater crime than war. The great war of 43 years ago was executed as a war of aggression by the Military Alliance of Three Countries: Japan, Germany and Italy. It was a war of greed by Japan, aimed at conquering Asia under the name of The Great East Asia Co-Prosperity Sphere. Motivated by defeat, Germany and Italy came to regret their fascism and changed their national flags and national anthems, in 1949 and 1946 respectively, as atonement for their aggression. In comparison, Japan, which massacred 20 million Asian people, has expressed no apology for its war time aggression. Japan has laid aside the question of the Emperor’s responsibility in war as supreme office, has not taken steps to change its national flag and national anthem. Japan has never reflected upon the historical crimes in which ‘Hinomaru and Kimigayo’ played a part, and again today, is enforcing them on us. SO I’m afraid of the frightening experience it might revive. Without reflecting upon its past and by assuming threatening attitudes, Japan is likely to repeat the same mistakes. In the Battle of Okinawa, the war produced 200,000 victims, 150,000 of whom were Okinawans, accounting for one-fourth of the Okinawan population at that time. These victims were mostly civilians, women, children and older people. There were a number of massacres by the Japanese Imperial Army, and group ‘suicides’ also occurred. All of these deaths were caused by a pre-war militarism and Tennoist education. Okinawans were mobilized for murder and supported the aggression in Asia, which ultimately led to the Battle of Okinawa and the group suicides. Fortunately, I had a chance to investigate the massacre-like group suicide induced by Tennoist education which occurred at Chibichirigama in Namihira where I was born and raised. I listened to the stories from the bereaved families or victims, discussed it with them and got involved in making the Statue of Peace Through the Generations. The group suicide at Chibichirigama, which claimed the lives of 84 persons, was sheer hell. The victims were indoctrinated with the Field Service Code, “Live as His Majesty’s Children; do not be humiliated by life as a surviving prisoner.” They killed their most dearly loved ones — children, brothers and sisters — as an expression of love to save them from humiliation in the eyes of Tennoism. It created a horrifying scene. In fact, 47 among the 84 were children under 12 years old. I have become a father of two children, and have come to understand parental love. I would unconditionally protect my children with my own body; I could not kill my loved ones even if heaven and hell should reverse. However, during the war, mothers killed their loved ones in Chibichirigama Cave and in many places in Okinawa. How on earth could they do such a thing? When I tried to understand these mothers’ feelings, a rage beyond all description surged within me. They were not victims of a group suicide. They were, rather, the victims of militarism and Tennoism education. They were massacred by the Tennoist of Japan. In Chibichirigama Cave, there were veterans who had returned from Southeast Asia and military nurses who had returned from China, all having observed the brutality the Japanese Army inflicted in those areas. In addition to their complete brainwashing by a Japanese education, these service people came to believe the propaganda that, “If even the Japanese have inflicted such brutality in China, if one were captured by red demons like the Americans, who have red hair and goat-like eyes, one would be treated worse.” They chose a graceful death as ‘Children of His Majesty,’ and killed themselves. When I try to look ten or twenty years down the road, I’m afraid that I only foresee a worse situation, and I become pessimistic about the possibility for peace. With the ‘Hinomaru’ at the head, and voices singing the ‘Kimigayo’ in worship of the ‘Emperor,’ the great war meant that the people were fully mobilized in support of Japan’s aggression abroad. In the same hamlet, Namihira, there is another cave called Shimukugama to which some 1,000 people evacuated. The story there was different. An old man, who had returned from Hawaii, refused to provide the Japanese Army with his house as their billet, so he was called un-patriotic. Together with another old man who had also returned from Hawaii, they negotiated with the U.S. Army to save everybody’s life. This ‘un-patriotic’ stance is the very thing that saved the lives of the people in this second cave of Namihira. In this case, ‘un-patriotic’ means ant-war, a wish for peace and the protection of human life. Only fifteen years have passed since Okinawa’s reversion to Japan. It is natural that there should be a difference in the attitudes of Okinawans towards the ‘Emperor, Kimigayo and Hinomaru’ from those of the mainland. Okinawa experienced its own history of hardships: the invasion by Satsuma in 1609, the colonization, the subjugation of Ryukyu by the abolition of clans and the establishment of Prefectures in 1879, the landing of the U.S. troops and U.S. rule in 1945, and its return to the mainland in 1972. The authorities on the mainland should sincerely recognize Okinawa’s characteristics, including its historical experience, culture, locality and so on. I’m firmly convinced that it would be good for Japan, as well as for Okinawa, to develop Okinawa’s unique characteristics and introduce them to the mainland. My action is just a small resistance against both mainland authorities and current Okinawan authorities who have ignored our characteristics, have tried to assimilate Okinawa to the mainland, and have forcefully impelled this assimilation policy. Yomitan village was the landing point for U.S. troops. Before land restitution, 78 percent of the village was occupied by U.S. based; now 48 percent of it is, and this compels us to live daily under the threat of military bases. We must constantly confront the bases in order to lead ordinary, everyday lives. Our village, Yomitan, surviving such circumstances, takes pride in having never allowed anyone to defeat its wish for peace and love. In addition, the mayor stated: “Sports and education should be free from any political pressure, because looking back on the history of war, there has always been political pressure on sports and education, and a terrible war was the outcome of subordinating them to politics.” This was the resolution presented at the Village Assembly of December 1986, protesting the enforcement of hoisting the ‘Hinomaru’ and singing ‘Kimigayo.’ It was endorsed by a majority of Yomitan villagers. A petition signed by 8,223 people demonstrated their will. Yomitan villagers united with enthusiasm to prepare for the National Athletic Meet, eager to ensure success. After arranging for all players to stay at private residences, while we were waiting for the actual Games to start, Hirose, the President of the Japan Softball Association, suddenly pronounced: “If Hinomaru and Kimigayo are not practiced, the site of the Games will be changed.” With that announcement, Hirose outrageously trampled the villagers’ spirit. The mandate was not even formally decided upon by the Association, yet the yamatonchu President, Hirose, abusing the power of his position, forcefully and singlehandedly overrode Yomitan’s will. This is unforgivable. When the will of the populace stands to be violated, I think it is entirely justifiable for the populace to firmly protect their will. Otherwise, democracy and the autonomy of citizens will not be safeguarded. One experience has always been: it is yamatonchu who cause trouble, and uchinanchu who suffer. I don’t think it overstates the facts to say that the cause of my action and its complete responsibility can be attributed to Hirose, who denied the will of the villagers. On the day following my arrest, my son was born. I am now the father of two children. I feel responsible for raising my children well and handing down to them a good society where they can live safely. Under the pretext of my act, a variety of serious disturbances ensued: threats of bombing the Village Office, harassment to my family and villagers, arson of my supermarket, assault, interruption of my business, destruction of ‘the Statue of Peace Through the Generations,’ and LDP pressure on the village administration. Thus, the ‘Hinomaru’ has proved to symbolize threats against others’ life, property of family by force. It has become a new symbol of the suppression of freedom of thought and expression. The mood seems to say that Justice is servant to Might, and Might is Right. The coercion of the authority crushes the will of the populace. It is nothing less than a revival of the pre-war period. It was the junior high and high school students who acted most bravely in Okinawa during this time. One high school student declared, “I refuse to attend the Meet if I have to play Kimigayo.” Another one refused to enter school: “I don’t want to attend the commencement ceremony under Hinomaru.” A junior high school student ‘refused to’ join in a chorus of Kimigayo; a Yomitan high school student pulled down the Hinomaru and threw it in a ditch at the commencement ceremony; and so on … When students heard about the war from grown-ups, read newspapers or fliers, learned of the conditions of U.S. bases and faced reality, some of them felt compelled to cry ‘NO’ in all sincerity and sensitivity. Their actions almost challenged the responsibility of us grown-ups who failed to stand up when we had a chance to. Anything that lead to war shouldn’t be tolerated. It should be resisted. I thought that the enforcement of ‘Hinomaru and Kimigayo’ would lead to war and shouldn’t be tolerated. As a result, I pulled down the flag and burned it. I am convinced that, in light of history, my action is perfectly justified. When I saw the bill of indictment prepared by the prosecutors, I found it far from acceptable and full of invention. The bill said I ‘attempted to disturb business operations,’ but there was no such evidence. No heed was paid my opinion, so it was incorrectly recorded in the bill despite my strong protest to the police and prosecutors. The truth is that after my action, the opening ceremony was carried out smoothly. Following the opening ceremony, even though there is no regulation requiring the flying of the Hinomaru for the Games, Hirose irrationally declared: “Since the Hinomaru is gone the Games should be cancelled.” He threatened the Yomitan Village Athletic Meet Committee and suspended the Games until the Hinomaru was raised again. If the Game was delayed for fifteen-minutes and ‘business was disturbed,’ it was President Hirose who disturbed it. As for invading the building ‘without reason,’ this was not true because I did have a ‘reason’ to enter, as I mentioned before. With all the facts presented by the prosecution the ‘Hinomaru’ was renamed the ‘national flag,’ which meant that the alleged damage was blown out of proportion, the will of the appellant was deliberately oppressed by the prosecutors, and therefore, the suit was privatized. I think it is a shame. In this trial, I’d like to reveal the intentions of the authorities, who are again using the Meet as a tool, tried to oppress Okinawa with Tennoism. Chibana Shoichi was sentenced to 1 (suspended) year in prison in 1992, and the appeal was rejected in 1995. 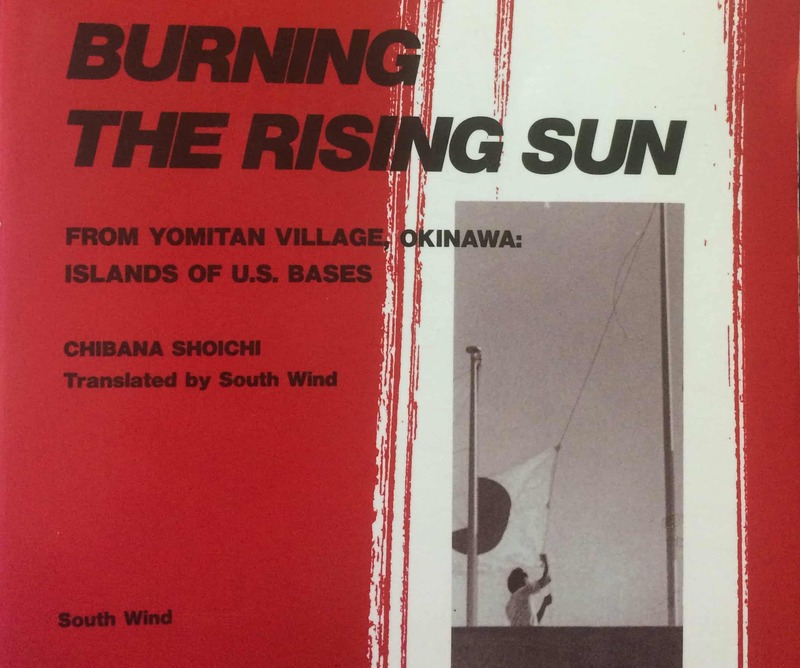 The Hinomaru was renamed to Nisshōki and made national flag as well as the Kimigayo the national anthem in the 1999 Act on National Flag and Anthem, 12 years after Chibana burned the flag, and 7 years after his conviction. Under Abe’s first government, education law was rewritten to be more ‘patriotic’ (see here and here). Since (at least) 2014 the Abe government is working with full steam at abolishing Paragraph 9 of the Japanese constitution. I close this entry with the poem the book starts with: For what did we fight? by Kurihara Sadako, protesting against the official welcome given to the minesweepers’ returning to Kure port from the Persian Gulf on October 30th, 1991. This was the first time Japanese “Self Defense Force” troops were dispatched abroad. For what did we fight? For whom did we fight? No husbands or sons returned. None of our students returned. Two hundred thousand people were burned in Hiroshima. One thousand, eight hundred and thiry-one people were bombed in Kure. A number of nightmares were conducted. And three million of our people, here and abroad. In Article 9 of the Renouncement of War. Departed, seen off with a crowd waving Hinomaru. The first time it was a mistake. The second time it is a betrayal. Never repeat building Hiroshima into a military city. Never repeat building Kure into a military port. Never turn our rifles to Asia.